Oral cancer can develop in any part of the mouth, including the lips, tongue, cheeks, floor of the mouth, roof of the mouth, sinuses, and throat. Risk factors for developing oral cancer include excessive use of tobacco products or alcohol and the contraction of the Human Papillomavirus (HPV). Treatment is available, but oral cancer can be deadly if not detected and treated early. Oral cancer is the sixth most common cancer with 42,000 new cases reported each year. The earlier oral cancer is detected and treated, the better the survival rate. During a routine checkup, about 10% of patients may have an abnormality discovered that should be tested for oral cancer. The dentist may take tissue for testing or send you to a specialist. Dr. Ruff performs oral cancer screenings as part the regular checkup for Fayetteville, NC patients. Oral cancer screenings are just one of the many reasons you should visit Dr. Ruff at Ascot Aesthetics regularly. During an oral cancer screening, the dentist examines the inside of your mouth as well as your head and neck for any unusual lumps, bumps, swelling, growths or discoloration. Common symptoms include white or red patches in your mouth or on your lips, repeated bleeding from the mouth or throat, and difficulty swallowing or persistent hoarseness. Growths or sores in the mouth that last longer than two weeks and won’t go away should be examined immediately. The leading cause of oral cancer is the HPV virus. HPV-positive oropharyngeal cancers typically develop in the throat at the base of the tongue and near or on the tonsils, making them difficult to detect without regular examinations. Although HPV-positive oropharyngeal cancers are often diagnosed at a later stage, people with HPV-positive cancers have a lower risk of dying or having recurrence than those with HPV-negative cancers. If oral cancer is detected, treatment options include a combination of surgery, radiation, and chemotherapy depending on the stage of development of the cancer. Patients treated in early stages may have little in the way of post-treatment disfigurement. 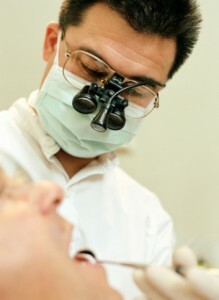 However, for those whose cancer is caught at a later stage, the results of surgical removal of the disease may require reconstruction of portions of the oral cavity or facial features, adjunctive therapy required to assist in speech and chewing foods, problems associated with the lack of salivary function, as well as the fabrication of dental or facial prostheses. For all these reasons and more it’s vitally important to schedule regular dentist visits. Contact Dr. Ruff at Ascot Aesthetics today for your next appointment. Dr. Ruff proudly serves patients in Fayetteville, NC Spring Lake, and all of Cumberland County.